While I’m a fan of virtually any kind of ice cream, there’s a special place in my heart for ice cream cake. Tasty frosting layered with ice cream is just wonderful. Being ever adventurous, I decided to defy the cold temperatures that have arrived and make an OREO Ice Cream Cake with Cool Whip Frosting. Most of us are familiar with the traditional Cool Whip whipped topping, but this would be the first time I would use Cool Whip Frosting. I found the Cool Whip Frosting in the freezer aisle, next to the regular whipped topping. There were three flavors to choose from – Cream Cheese, Vanilla, and Chocolate. For my ice cream cake, I grabbed a tub of Cool Whip Frosting Vanilla and Cool Whip Frosting Chocolate. Once I got home, it was time to start assembling the cake. First, I let the Cool Whip Frosting thaw for an hour. Just like the regular Cool Whip, it is frozen and should be thawed before use. Sometimes I may keep the Cool Whip frozen anyways, but I’d need to spread the frosting, so I let it thaw. 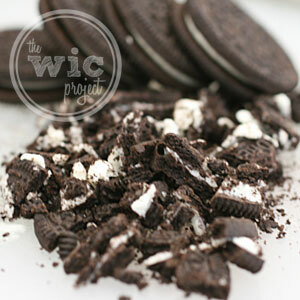 While it’s thawing, chop up some OREOs into pieces. Once the frosting is thawed, mix in the OREOs into the Cool Whip Chocolate Frosting to create a frosting mix that looks so good, you’ll need to sneak a taste. Go ahead – I encourage it. It is AWESOME. The frosting itself has a rich chocolate flavor while still being light and airy. Not too sweet, just enough flavor, and good enough to eat with a spoon. 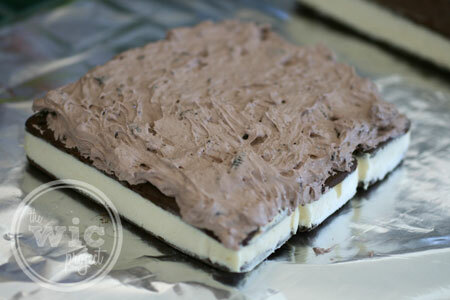 Next, lay down a layer of foil which you’ll use to wrap and store your ice cream cake. Then, put down a layer of the vanilla ice cream sandwiches. Top that layer with about half of the chocolate frosting/OREO mix. I noticed that the Cool Whip Frosting is much easier to layer and spread than traditional frosting. It wasn’t thick or sticky, but very smooth and easy to work with. On top of the frosting mix layer, add another layer of ice cream sandwiches, then repeat one more time. Your final cake should be sandwich – frosting – sandwich – frosting – sandwich. After your cake is frosted, carefully wrap it in foil and put it in the freezer for about 4 hours to let it harden. 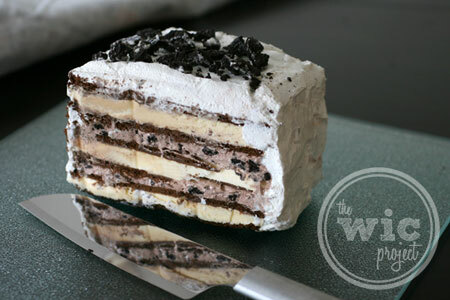 Once it’s frozen, you’re ready to enjoy this delicious OREO Ice Cream Cake with Cool Whip Frosting! 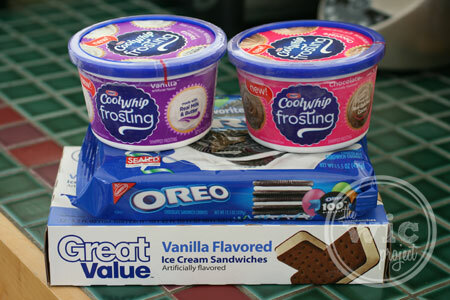 I was so impressed with the flavor of the Cool Whip Frostings and loved how much easier they were to work with than some of the traditional shelf-stable frostings. They’ll definitely be a great frosting to top any cakes, cupcakes, or other desserts. Create a delicious frozen, layered treat. Allow Cool Whip Frosting to thaw for 1 hour. 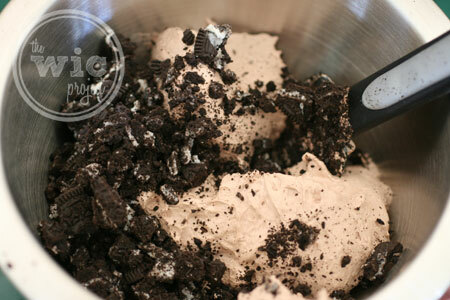 Mix chocolate Cool Whip Frosting with chopped OREO Cookies. 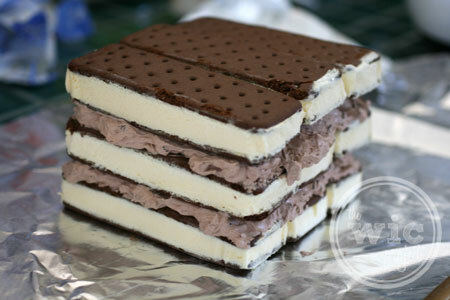 Arrange 4 ice cream sandwiches, side-by-side, on a 24-inch-long sheet of foil. Top with half of the Cool Whip Frosting/OREO mix. Top with remaining ice cream sandwiches. Frost the top and sides with the Cool Whip Frosting - Vanilla. 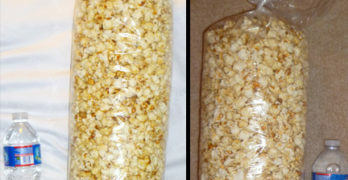 Bring up the sides of the foil; double fold top and ends to create a loosely sealed packet. Disclaimer: I am a member of the Collective Bias™ Social Fabric® Community. This content has been compensated as part of a social shopper insights study for Collective Bias™ and Kraft Cool Whip. #CoolWhipFrosting #CBias #SocialFabric. All opinions are my own. Oreos are my absolute favorite cookie. I can’t wait to try this. 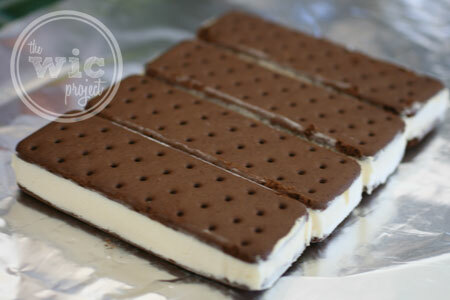 Ice cream sandwiches are my absolute favorite; and your recipe is so easy to follow. Looking forward to surprising my family with this delicious treat! Thanks for sharing. What a wonderful recipe – one I’m sure my whole family would enjoy, especially topped with creamy Cool Whip Frosting 🙂 Thank you so much for sharing your delicious cake! I love ice cream cake. And this one sounds so simple to make. Wow that looks amazing!! Loved it and very easy to follow. This is something I would make and take to an event because it looks so great and I am sure tastes awesome. Thank you for sharing! Wow, this looks droolable good, lip-smacking wonderful! I am going to have to try this soon! Love this and so simple to make.My husband is a big sweet eater and would love this! I pinned this recipe to Pinterest! I am going to make this recipe for Christmas! I think that it is easy to make, and I did not even know that Cool Whip made frosting! Thanks for this post! This cake sounds delightful. Our Mother used to make a somewhat similar cake we named “Freezer Cake”. This recipe called for real whipped cream and chocolate thin mint cookies. After put together, she would freeze until solid and we would dig in! I’m getting tempted just by reading this, I might have to try making it for Christmas. I would have never thought of this. Such an awesome idea. Thank you so much. This is so easy! Gotta make this now. Thanks! This looks so good. My family loves oreos. This will be on our table for Thanksgiving. Thanks! oh my gosh…looks & sounds just awesome…can’t wait to try it! This look really tasty and simple to make. I might try this for my son’s next birthday I bet he would love it. Oh my word this look amazing!!! I just saw that they have Cool Whip Frosting at the stores last week! I am so excited to try it out. I bet it’s wonderful!!! 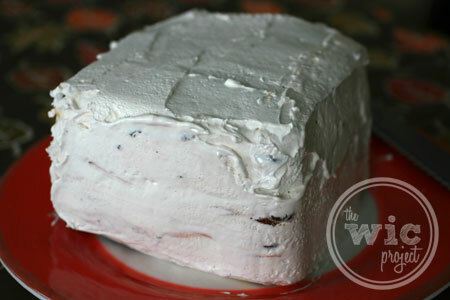 I love the easy recipe, and have been dying to find an excuse to try that chocolate cool whip frosting… this Oreo Ice Cream Cake is it! I may just have to make this over the weekend! It looks soooo good. 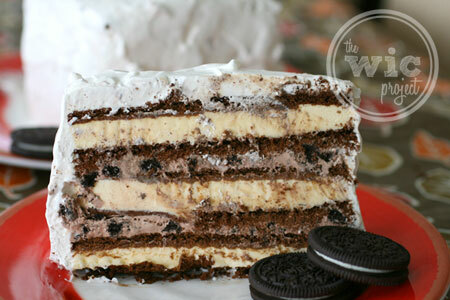 The Oreo/frosting layers seal the deal for me. Creamy & crunchy together – yum! i love this idea. i printed the recipe so i could share it with my grandsons. they like to make fun stuff like this. Great recipe,is so simple to prepare it:)and it looks yummy. this would make a great birthday cake for my daughter this sunday. she loves oreos….who doesn’t…lol. i have never heard of cool whip frosting. i hope i can find it at my store. Wow, what a great idea. Everybody in my family are partial to ice cream cakes but other than buying one, I never saw any other option. This looks fairly easy to make. Thanks for sharing.